Books are a favorite symbol, a venerable icon, a useful tool for developing ideas in Renaissance paintings. They do sometimes make unusual appearances, this time--and not too unexpectedly--in the work of Hieronymus Bosch. The painting, Cutting the Stone, (also called The Extraction of the Stone of Madness or better yet The Cure of Folly) was completed by Bosch in 1494 and lives today in the Prado. Bosch was at the very least a very curious character, hardly a man of his time--he seems difficult for us to place in the 15th century given the extraordinary range of his deep imagination. He seems to be more a man of the modern times rather than one of the Renaissance. I mention that the painting is in the Prado, finding its way there from the collections of Spanish sovereigns, who collected Bosch as a deeply Christian painter who depicted the travesty of sin and moral neglect rather than his own deep fantasy. my name is Lubbert das"). The man in the chair, the man undergoing some sort of cranial/brain surgery is an everyman of sorts, a Dutch Everyman Fool named Lubbert (translated to "castrated dachsund").. A charlatan medico stands and removes symbols of lunacy and foolishness from his brain, images of flowers standing for the fool's stone of long folklore. The medicine man wears an inverted funnel for a hat, a symbol for emptiness, nothingness. Likewise his purse is stuffed with straw, another iconic display of greed compounded and gaining nothing at all. 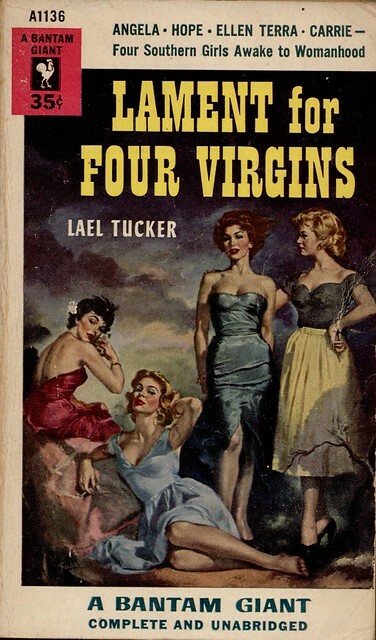 But what I am attracted to right now in this painting is the woman on the right balancing a book on her head. It seems to me to be a very rare case of a Renaissance image of a book displayed in this manner--usually books are simply held and are symbols of learning or wisdom or piety. In this case, the woman is just part of the general folly which is the concern of the quack surgeon, a closed book (impossibly?) balanced in tribute to the craziness before her, perhaps hoping for the words to seep through the pages and into her own head. There are a number of other images of this operation, which was in its way a standard procedure for the relief of insanity, or depression, or lunacy, or basically of any mental complaint or "error", which can be found (along with description) on the bioephemera blog, here. Its a pretty miserable scene. Again, I'm really just after the book in the Bosch. If the Maginot Line could float, it might have been well represented by the U.S. Navy during the 1930's (and up to about, say, 7 December 1941). It was pretty much understood that the previous thinking about battleship power as the mainstay of naval capacity had to be re-accessed following the Japanese attack on Pearl Harbor, and that the aircraft carrier and naval air power were certainly, absolutely, a devastating new weapon and strategic initiative. The power the attack on Pearl by a task force of aircraft carriers had already been demonstrated to the ruling powers of the U.S. Navy and by one of their own, nine years earlier, at 0800 hours on 7 February 1932. During Fleet Problem XIII and Grand Joint Exercise 4 Vice Admiral Harry Yarnell (1875-1959, U.S. Naval Academy Class of 1897), showed the rest of the Navy what the aircraft carrier could do. In the war game between two naval forces (blue vs. black) Yarnell (commanding blue) chose a different approach in confronting the black team. Rather than have the battleships duke ti out in horizon-to-horizon shelling, he brought his force of two aircraft carriers (the Lexington and the Saratoga) and four destroyers (all under radio silence) from California to the home base of the black team at Pearl. Operating beyond the normal shipping lanes and squalls he was able to successfully approach the base without being detected, and launched 157 planes against the ships and the defending aircraft (which was still on the ground). Committing imaginary strafing Yarnell's attacking force decimated the defending aircraft; and in dropping flour-sack bombs the attacking force pulverized the ships docked at Pearl. It was an extraordinary victory for the blue team, and it should have been a monumental wake-up for all those decision makers involved in running the Navy. In spite of the obvious victory by Yarnell, the exercise was seen as something as a fluke, and the umpires evaluating the manuevers judged the use of the aircraft carrier in a possible attack on Pearl Harbor to be "doubtful". In his review of teh exercise Yarnell clearly stated that the aircraft carrier should become the main arm of the U.S. Navy--it would certainly be so for other navies, including potential enemy navies, thereby putting the U.S. on an unequal footing should this course of action not be followed. He was certain that he demonstrated that a major change was due in American naval tactics and strategy, and that in order to fight a transoceanic war that six to eight aircraft carriers would be necessary. Between 1936 and 1940 the U.S. Navy laid keels for twelve ships, including eleven battleships and one aircraft carrier. Yarnell retired in 1939 at age 64, after having been the admiral in command of teh U.S. Asiatic Fleet. When the Japanese attacked on 7 December 1941 they did so using six aircraft carriers (each carry between 54 and 72 planes) for a total of 387 planes (excluding spares and including 48 air patrol Zeroes and six seaplane scouts for reconnaissance). And that, as they say, was that. The funny thing about these results is that the New York Times seems to have been reporting on the progress of the maneuvers throughout their course, over a period of weeks,k which would (if we assume that the commanders and officers in Hawaii were reading the newspapers) tip the hand of a "surprise" attempt, further weakening the case for the battleship folks. 1. "ARMY IS PREPARED TO 'DEFEND' HAWAII: Officers Inspect "Black" Defenses From Air -- Planes Mass for War Manoeuvres. ATTACK" DUE SATURDAY " Blue" Forces Under Command of Admiral Leigh Slips Silently Across the Pacific. "New York Times (1923-Current file) [New York, N.Y] 04 Feb 1932: 13. HONOLULU, Feb. 3 -- Hawaii's "Black" army settled down today in its field positions to await the onslaught of the "Blue" force, which is steaming somewhere in the Pacific, en route for its attempted conquest of these islands. Defense arrangements have been completed in every sector and installations have been inspected from the air by a staff of officers and reported satisfactory. "BLUE FLEET CLOSES NET AROUND HAWAII: Defenders Forced Back by the Growing Pressure Wireless to THE NEW YORK TIMES." New York Times (1923-Current file); Feb 10, 1932; ProQuest Historical Newspapers: The New York Times (1851-2007) pg. 15. If you take a closer look at the reclining figure just abpve the word "giant", you can see that she is one, unintentionally. She's just badly drawn, or something, a victim of foreshortening--we can see that her leg from her knee to her foot is as long as an entire keg of her companions, making this person about eight feet tall. On the heels of the eight-foot-tall woman comes one who is far more famous, ultra-famous, really. Le Dejeuner was a scandal when it was exhibited in 1863—Manet painted what he wanted to, unbound by perspective, by color, by composition, and on and on. The folks in the painting were not connected to anything, really, and were unconnected to each other, no one paying any of the others any mind, even when the women were naked. Nothing seems to be going on—the people are just simply there. This is in itself was a disconnect from previous practices, the vision in painting was about something, and was directed. Light seems to be coming from a number of different places, and the shadows from the trees reflect this, simultaneously stretched towards and away from the light sources. The bathing woman in the background, or what used to be background, had she been drawn using proper perspective, would’ve been about nine feet tall. But what happens here is that there is no foreground or background in this painting, just middle. It was this collection of abandonments, starting here in the Le Dejeuner in 1863, that ushered in the modern in art. Then there's the fifty-foot-tall woman who really isn't that tall in relation to the people around here. There are times when even things that are made to look extraordinary and plainly, outrageously identifiable as what they are, simply aren't--and sometimes they're not even close. For example, this cover of Fantastic Novels (1921?) seems to tell a straightforward story, but as it turns out the giant is giant but one living within a world in an atom of a gold wedding ring. (I told a fuller version of the story of thiis here.) So this giant is a giant but only so in her own world. Rabelais’ Gargantua and Pantagruel, Hobbes’ Leviathan, the Buddha at Yungang (Shanxi) and Melville’s whale were all pushed to their competitive monsterous edges in the 1950's, when you were more likely to think of The Bomb and creeping Communism before thinking back to any of these great representations. And it is also my general impression, having been paging through Life magazine for the 1950's, that there are some other major, lesser heralds of gigantism, especially if you paid attention only to the advertisements. There were 1950's colossal characters who were pale imitators of their earlier counterparts–the Amazing Colossal Man and Colossal Woman being two minor mirrors of older ideas--but they hardly contained the colossal ideas that were resident in the earlier creations. (Perhaps part of that is due to having just witnessed the demise of two enoromities in Hitler Stalin.) But this woman seems to be the largest of the lot--I make her to be about 100 feet tall. There's really nothing deceptive about her, except of course that this giant is only a head. It turns out that one of the most famous and iconic books on chess is really not about chess at all. Jacobus de Cessolis, (Jacopo da Cessole, c. 1250 – c. 1322) the author of The Game and Playe of the Chesse1, found its way into print in the very highly capable hands of William Caxton in 1474 ("Fynysshid the last day of marche the yer of our lord god. a. thousand foure honderd and lxxiiiia") and into a second edition in (about) 1483. Caxton produced a spectacular, beautiful work on moral and ethical virtue and challenge, using the game of chess as the foundation for metaphor and aliteration of the wide classical literature that it calls upon.2. The book doesn't tell you how to play--but it does instruct on how to live. A great aid to the book's power are the sixteen strong woodcuts ("repeated to make twenty-four figures"3), which mo doubt were a strong influence on their viewers. I have included this entry in this blog's History of Lines series for the connection between the lines of morality and the lines of he chessboard and the movement of its pieces, which were at last the outward and symbolic basis for the ethical lessons of the work if not used in actuality. 1. The book was one of the first books ever printed in English, and was probably the first morality play printe in the language. It was reprinted many times, later under the title of Liber de moribus hominum et officiis nobilium super ludo scacchorum ('Book of the customs of men and the duties of nobles or the Book of Chess'). 2. Arthur Hind, An Introduction to the History of Woodcut, 1935. Volume II, p. 708. The authors named in this study include "Saint Ambrose (2 references), Anastasius (1), Avicenna (2), Saint Augustine (9), Saint Basil (1), Saint Bernard (2), Boethius (3), Cassiodorus (1), Cato (5), Cicero (6), Claudian (2), "Crete" (1), Diomedes (1), Florus (1), Galen (1), Helinand (4), Hippocrates (4), Homer (1), Saint Jerome (3), John the Monk (1), Josephus (4), Livy (2), Lucan (1), Macrobius (1), Martial (1), Ovid (6), Paulus Diaconus (1), Petrus Alphonsus (2), Plato (4), Quintilian (3), Sallust (1), Seneca (15), Sidrac (1), Solinus (1), Symmachus (1), Theophrastus (1), "Truphes of the Philosophers" (2), Turgeius Pompeius (1), Valerius Maximus (23), Valerian (7), Varro (1), Virgil (2), "Vitas Patrum" (2)." JF Ptak Science Books Post 1615 Part of a series on destroyed New York City that includes New York City: Attacked by Tentacled Flying Saucers, Giant Flying Snakes, Glaciers, and Mining Missile Space Aliens, 1929-1941 and H-Bomb Wipes out Brooklyn, among others. John Ames Mitchell created quite a world for himself in 1889. The world he saw in the year 2851 turns out not to support America, or Americans, seeing as how we ran out of luck and envy and possibility and Life. It is slightly ironic that Mitchell (1844-1918) would write so much about dystopic views of America's dead culture, as he was the creator and first editor of (the first) Life magazine, a journal dedicated to far less weighty matters (and an early popularizer of populist views of American culture by Dana and Rockwell). have thrown floods of light  upon the domestic life of the Mehrikan people. or what enthusiasm his discoveries would arouse among Persian archaeologists. Every student of antiquity is familiar with their history. " Mitchell also has a nice way of showing how his explorers were trying to make sense of the ruins, figuring out what their intended uses were. For example, the ruins of the Brooklyn Bridge were more a monumental temple, because the distance between the giant structures and the shore were (for them) to great a span for the things to be part of a bridge. There's some good, solid, imaginative imaging going on here. 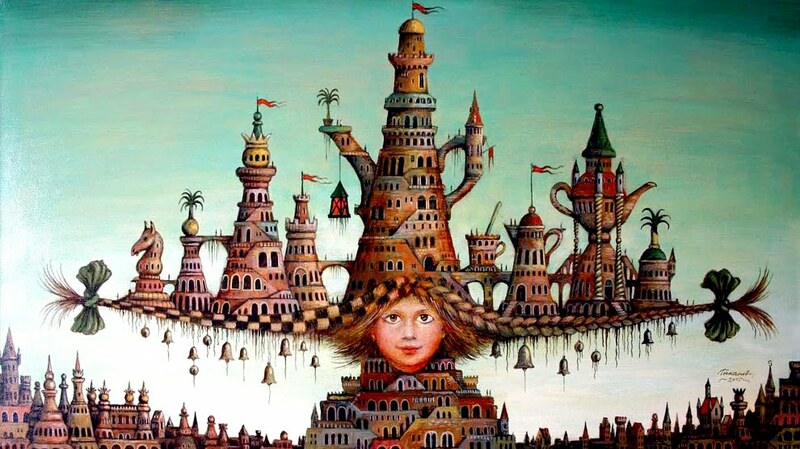 Fabulist & Fantastic Architecture: Alice in Wonderland to the Library of Immanuel Kant. Sergy Tyukanov. I just wanted to share in this very quick posting the extraordinary work of the Russian artist Sergy Tyukanov (b.1955), who paints/etches/draws fantastic images calling freely on legendary literature, folktales, history, philosophy, as well as the work of some earlier masters (as in the Bruegels and Bosch, seen in the last two images). If you follow the link to his website you'll find that some of these images--which in their nature seem to be telling you that they are enormous works--are actually very small, on the order of one square foot. Fabulist artists like this, especially those anthropomorphizing their subjects, have always been of great interest to me. ANd I've got to say that Tyukanov's architecturals remind me very strongly of ideas in the 18th century French visionary architects like Lequeu and Boullee and Ledoux. I think it is a remarkable thing, a beautiful piece of explorative artwork when taken out of context. As it turns out there was--in Real Life--a Fat Bank opened somewhere in our fair land, a fat bank made for people to store their own fat from surgical enhancement procedures that could be used sometime in the future to be used elsewhere in the depositors' bodies. Fat Redux, Redux: Fat Bullets, 1945. There is no doubt a history that could be written on shadow cities, cities that were built to resemble other cities, cities constructed to serve as a deterrent or double, cities set to deceive, cities constructed to be experimented upon. Some were built ot be destroyed. Like Paris--or "Sham Paris". Augustine cleaved two cities from one, the good and the doomed, in The City of God. The powers that were in Paris at the end of World War I tried to do exactly that—to create a Sham Paris located on the outskirts of the real city—it was to be doomed, offered with confusing lights and displays that would disorient German aviators into bombing and destroying it rather than the real city. Of course these were also the days of pre-RADAR, and of aviators simply holding a bomb by its fins and letting go once a target was in sight, so the possibility of causing this sort of dissonance was at least palpable. The planes held the pilot and a lot of fuel, and not much flight weight was devoted to bombs, so the bombing runs were necessarily quick and comparatively light (by standards of just a decade later). So the idea of a Sham Paris might’ve, could’ve sort’ve worked, maybe; but not really. It had a very strong, fatal, feculent (thank you for this word, Mr. Depp) air about it, like that misty doomsday smell that lifted the Maginot Line out of the earth and dumped it in the dim and stinking past. Sham Paris was only partially constructed before war’s end in November 1918. Its important to distinguish Sham Cities from hidden cities, like Project Iceworm (the underground city built in Greenland) or Mt. Weather (the not-so-very-secret secure and safe bunker for the governing class in Bluemont, Virginia) and so on. Sham Cities were definitely constructed for deception and/or destruction. The next city we'll take a look at: Survival Town, Nevada. Part of this blog's History of Holes series. (See, for example: An Episode in the History of Holes: Electricity, Punched Cards and the Computer, 1878, here; History of Holes--Filing Holes Up, here. And fifteen others. Edwin Black's one-trick pony, IBM and the Holocaust, I'm sure was a consolidation of grand assertions that helped to sell a book. As a history I find it manipulative, like a person on a mission to say something and uses only what is positive to that end. On his website, Black states: "IBM and its German subsidiary custom-designed complex solutions, one by one, anticipating the Reich's needs. They did not merely sell the machines and walk away. Instead, IBM leased these machines for high fees and became the sole source of the billions of punch cards Hitler needed." If you read between the lines this sounds like standard operating procedure that IBM would've followed with anyone; but on the face of it Black creates the case for IBM automating the Holocaust. The poster has a very provocative cache, and taken somewhat out of context it might be viewed as dustjacket artwork for Black's book. The all-seeing eye absorbing the information of teh punched card, with the unfortunate, looming, belching smokestack there in the foregoround, reminiscent of the chimneys in the concentration and extermination camps. But this poster was executed around 1925, well ahead of any of those events--the design by serendipity happens to visually support the author Black's assertions. Its just a nasty-looking object. First Use of the Term "Super Computing"
The earliest use of the term "super computer" seems to com from the New York World, ("1920" though actually 1929), and was applied to a unique instrument made by IBM for Columbia University. The The Columbia Difference Tabulator, completed that year, was nicknamed the "Packard", after the large, streamlined-but-bulbous American luxury car of enormity. And a picture of the great beast, below. "The new machine "mass-produced the sums of products by the method of progressive digiting and read punch cards at the rate of 150 per minute. 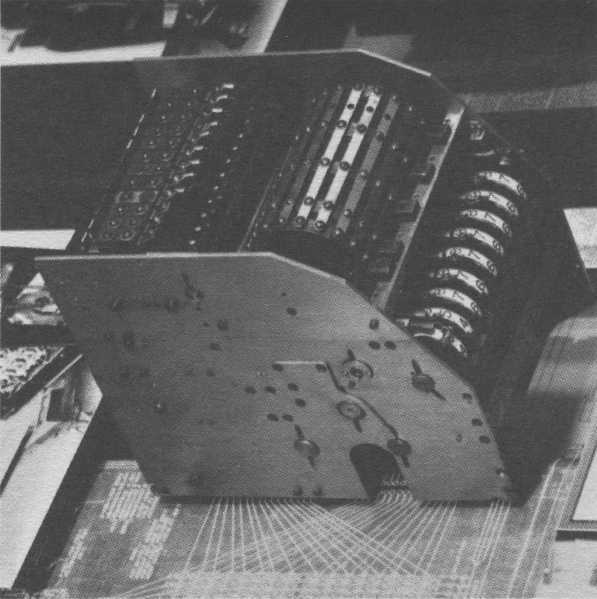 It contained ten 10-position counters with provision for shifting totals internally from one counter to another – a capability that anticipated a future function of computers." . 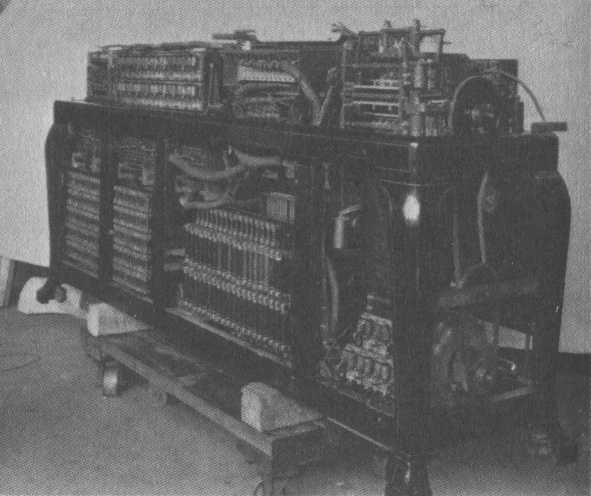 The new machine, variously called the "Columbia Machine", the "Statistical Calculator", the "Difference Tabulator", and (because of its massive size) the "Packard", was delivered and installed in 1931." --From the Columbia University site, here. Idea source: Eames, Charles; Eames, Ray (1973). A Computer Perspective. Cambridge, Mass: Harvard University Press. p. 95. More links and references at Columbia University's computer history page, here. Let's just say it: the history of diarrhea is not pretty, It has been a major killer throughout history (coupled with the sometimes historically-indistinguishable dysentery), wiping out perhaps hundreds of millions of people over human history. Infectious diarrhea and dysentery is especially suited for crowded, cramped conditions with poor sanitary facilities and bad food, which makes armies a perfect place for those diseases to easily succeed. In the American Civil War diarrhea was a leading incapacitor and killing disease, perhaps chief among the diseases that killed more people than did the actual fighting.1 And perhaps no where else did it commit such great tragedy than in the ranks of the Confederate soldiers, who by and large had considerably less than the Union soldiers. Poor sanitary facilities, bad food badly prepared, close living conditions, weeks/months of stationary encampment during the winter, would all add up to a disaster. Since the Confederate records of medical treatment are far from complete, we have to look at those of the Union Army to get an idea of what happened with diarrhea--and there, more than 250,000 men were discharged for chronic diarrhea, or roughly 10% of the entire fighting force over the course of the war. I think it is safe to assume that the Confederate numbers would be at least comparable and probably worse for a fighting force of approximately half that size, though I am unsure of how many of these actually were discharged. The figures for soldiers suffering from diarrhea who were not killed by it or discharged for it probably ran over a million for both sides. It would not be easy to overstate the vast impact that diarrhea had on these armies, and particularly for the Confederacy. On the side of success we have the story of gunpowder. Or, rather, the failure in the production of industrial nitrates necessary for the production of gunpowder which was addressed by the Southern citizenry, and particularly the women of the South. Absent the essential component of potassium nitrate, the Confederate states resolved to produce the stuff locally, in the old fashion. Urine (and water from cesspools, privvies, and so on) would be collected, and then (via one of many methods) would be sprinkled on straw or some other similar organic material (to keep the material moist but not wet); the stew would be covered and sunned and allowed to cook for some months at the end of which time the straw would be washed of the material formed on its top, and then dried. The resulting salts produced by evaporation would be a form of saltpeter, or potassium nitrate, which provides the necessary O2 for combustion. I know that it was at least considered customary and a rule of engagement for the Union and the Confederate soldiers to not shoot each other while attending nature's call; I'm not so sure that this would be the case for the guys in the night waste wagons collecting privvy drawers and urine. Just another small, necessarily savage bit in the history of killing. Did Galileo Know That He Was Galileo? "Karl Marx did not know what we know: he did not know that he was Karl Marx." The author suggested that Marx would've had a better time in his life had he known what influence he wielded in what he was writing--basically, Karl Marx didn't know that he was KARL MARX. It is an interesting--and frightening--idea to think of someone laboring like that laboring (as it were) away in relative obscurity, or at least relative to the monumental influence it would come to have. The real question is not how many people might be in this category of not knowing who we know them to be, but if everyone is in this category at one point or another, and how long it took for them to understand the lasting significance of their work. But for right now I'm interested to know what people think of the following ten science personalities, and to answer (in a simple survey), if they knew the significance of their work. The survey is simple and fairly straightforward, and asks questions regarding Copernicus, Harvey, Galileo, Einstein, Maxwell, Newton, Turing, Darwin, Lucretius and John Von Neumann. You'll have a chance to view the survey results at the end. Thanks! In mid-Victorian England lived high possibilities for the use of electricity, in industrialism, in tools, and machines--but I think most of all, it was the new appearance of Revolutionary Machines that seemed to me to offer itself as the new religious altar for the mass of people. After all, machines looked absolutely beautiful--and it wasn't just the machines, but their housings as well, what with some of these massive things being housed and supported by absolutely gothic-inspired designs, making the entire unit seem as though it was not only used by was the seat for some sort of belief. And like anything else, some of this belief-and-application system went a little too far, as we can see in this 1868 cartoon from Punch magazine. 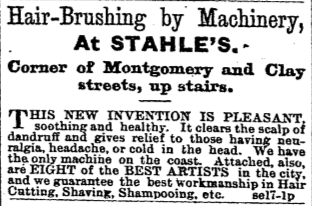 There were new machines that could help the barber to treat hair--or in this case, brush it--but the new machine didn't really do that much good, so the thing might not have existed at all except to keep the barber from being bypassed by his more-modern companions. But at the base of it all, like so much in Vctoria-ville, this machine happened to by Boy-powered. The cartoonist was just having a jab at the over-reaching of more-complex machines to do simple work, along with a sideways social poke at the idea of child labor.